For two nights I decided to go slightly outside the box concerning my travel style and head for the beaches within its own “box” in Durres. 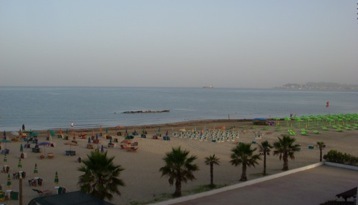 Durres rests on the shores of the Adriatic Sea and is a port with ferries heading to Italy from Albania. 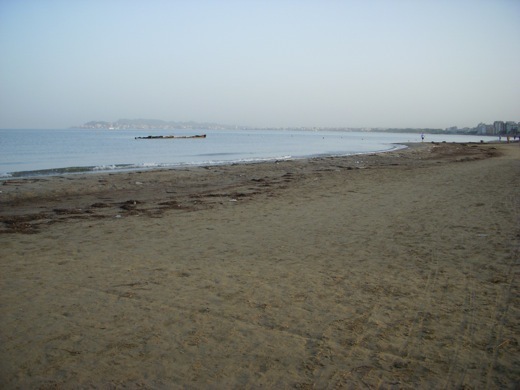 Viewing the beach that spans from Durres to Kavaja, about fifteen kilometers, one can learn the ridicules view of the Albanian mind of business. There are literally hundreds of resort hotels and apartment buildings that are packed in between the highway and the beach the width under a kilometer in most places. The busy season is only two months a year in July and August, and in June and early September, only the weekends are busy. And, they wonder why making money is just “so-so”? 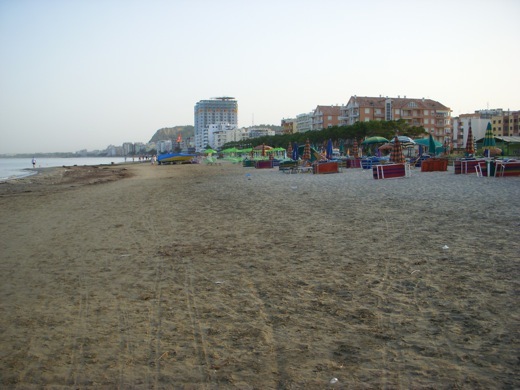 It is said that there are 600,000 tourists visiting the beaches of Durres a year. The concept that is missed among the hotel beach owners is the effect of overly severe competition. The facial expressions and conservativeness concerning the air conditioning are evidence of the moderate yearly income and their strange behavior about services. I inquired with many people, and they all said the same story about the beach area and the competition. A crazy concept is that the area is infested with mosquitoes so the deck-door cannot be opened at night because they never installed screen doors. Also, the LP says that many people get skin infections during the high season because of the crowed area; even so, the area during June without the week is quite and relaxing. Hotel Oaz on the beach was very slow, not even half of the hotel was occupied. 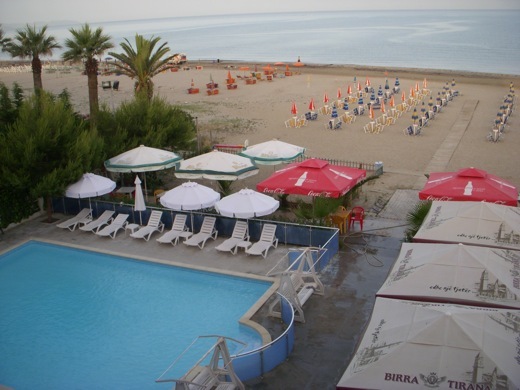 And, the entire area of the Durres beach strip was very slow despite the weather temperature hitting 90* F/35*C.
Hotel Oaz is a great deal at only 28 Euro a night, but the price considerably increases in July and August. The swimming is wonderful in the sea and the pool. Floating in sea water is the bomb—a teaching tool to surrender inner control by fully relaxing, breathing deeply to relax the stomach muscles. Laying and walking on the Beach is ultra relaxing. Easy to wash and dry clothes in the room, each deck has a unique try to hang towels and wet clothes. The hotel food and restaurants within the area is absolute garbage and over priced, I did search out one basically good restaurant with good rice, but the vegetables are still bad, the worst I have ever eaten. The other hotel customers (not all) are not friendly, their selfish, bored, they litter, and are prone to jealousy. These type of resort area attracts certain type of holiday-makers—many are over-weight. The area is infested with mosquitoes at night. It is kind of comical, the people that were supposed to spray the eggs in the spring forgot. Because of the severe hotel competition, the owner does not want to run the air conditioning all night, and the door to the deck cannot be open because of the mosquitoes. These room get very hot and they cannot figure out to get screen doors for the deck and fans in the room. Since the area is based on self-centered tourism/resort style—spiritually, it is empty, but the water is delightful. Several sources told me that after 1991 only one person named “Papato” built the beachfront hotels and apartments—all of them—and then he sold them to private owners. 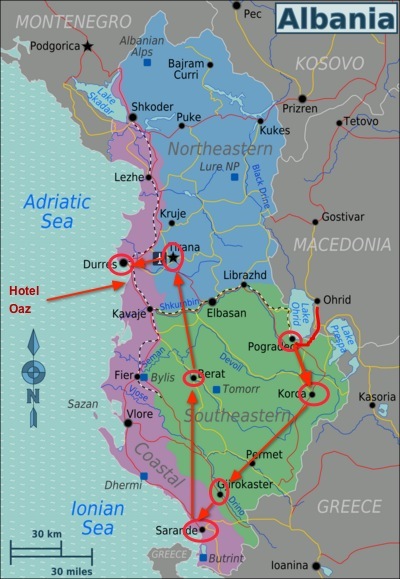 “Papato” might of been connected with the ultra corrupted government of Albania from the stories I was told. It should be clear that the Government grasped control to throw the private owners into debt, but not necessarily all the owners, but this concept could possibly be incorrect. The town of Durres itself is OK, I am just staying one night and going to start heading north. A visited with a couple of people that were heading south in Berat and already visited Durres and they comment how they did not like it; I can see why, the people here seem very arrogant, very different from Tirana. There was some black men walking down the street, to me they looked like African Americans, and I was stunned on how many locals were reacting and mocking just because they were different. Albania is just a strange country but I can understand why the neighboring countries in the Balkans dislike Albania—their closest bond is with Italy. Next post: Tirana, The Capital City of Albania! Previous post: Berat—A Charming Town in Albania.